In good order, an early 1800's US officer's Eagle head sword. With traces of etching, this sword probably pre-dates the US War of 1812. 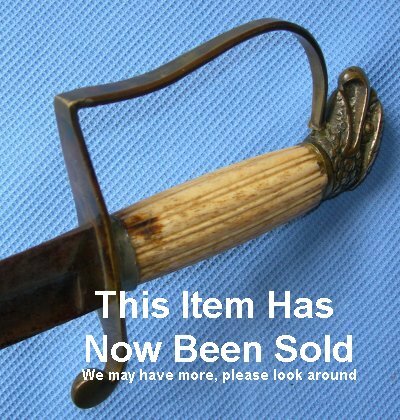 The 28 inch blade shows the remains of etching, very early 19th Century etching, is in overall good order and firm in the hilt. 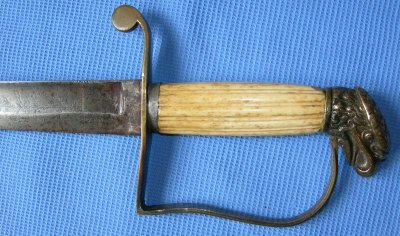 The ivory or bone grip is good, some small loss, the hilt generally good, some slight movement. Well worth our price of £? (too late, now sold). Further / full-sized pictures available upon request. Please quote item reference number B76 (566).